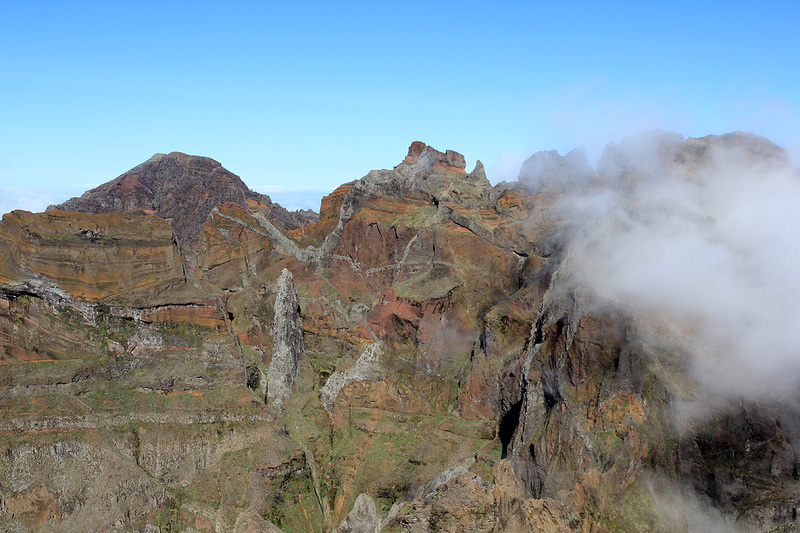 Note that this entry contains a description of the famous traverse from Pico Arieiro to Pico Ruivo, see further below. 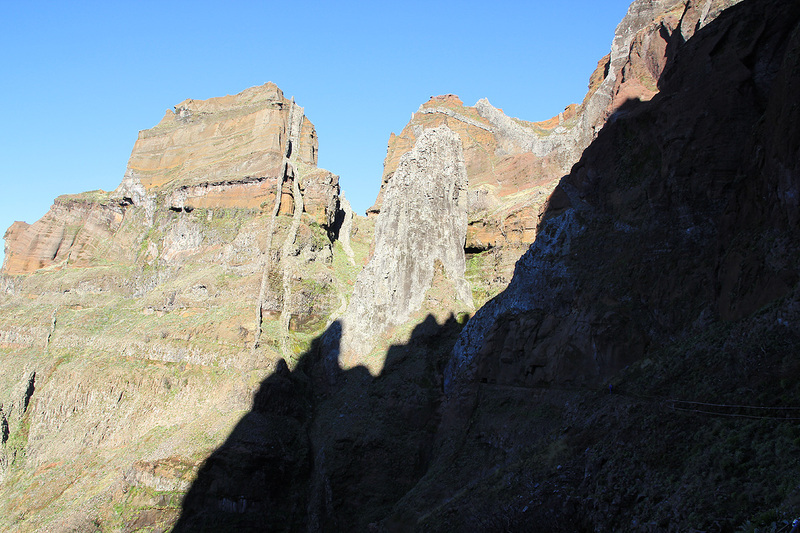 Summary information about all hikes and climbs in Madeira. 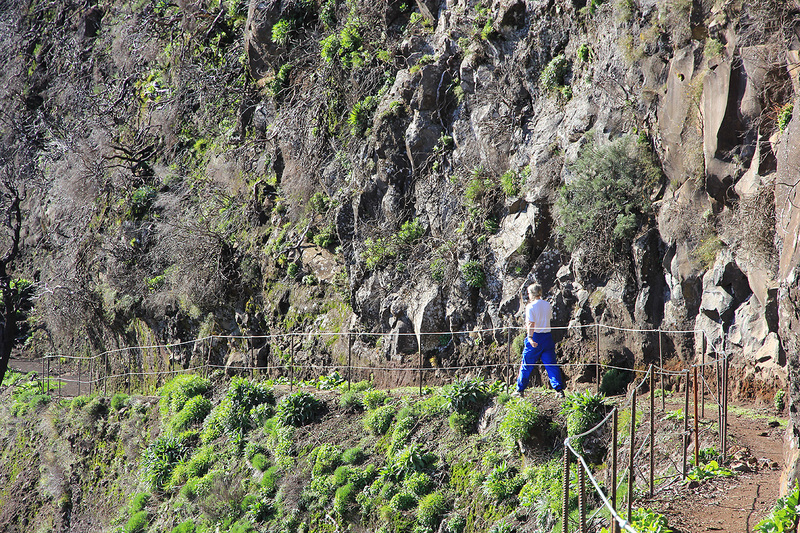 The starting point is the main road in Funchal running parallel to the waterfront promenade. Locate the plaza where two rivers merge and the traffic can turn in a somewhat rectangular traffic "circle". Head uphill on the right hand side (east) of the west river (ie. the river that is most left when viewed from the sea side.) In just a little less than 1 kilometer from the start, locate an orange Galp gas station on your left. Turn right exactly as you have this gas station on your left side. Continue driving this road uphill. Whenever there is some fork, just continue on the (main) road that heads uphill. You will eventually get to a small place called Monte. After 8.7 kilometer, keep left (uphill), at kilometer 14.6, you are at Poiso, 1412 meter, turn left here and continue to kilometer 21.0. Keep left (uphill) and park on your left side. 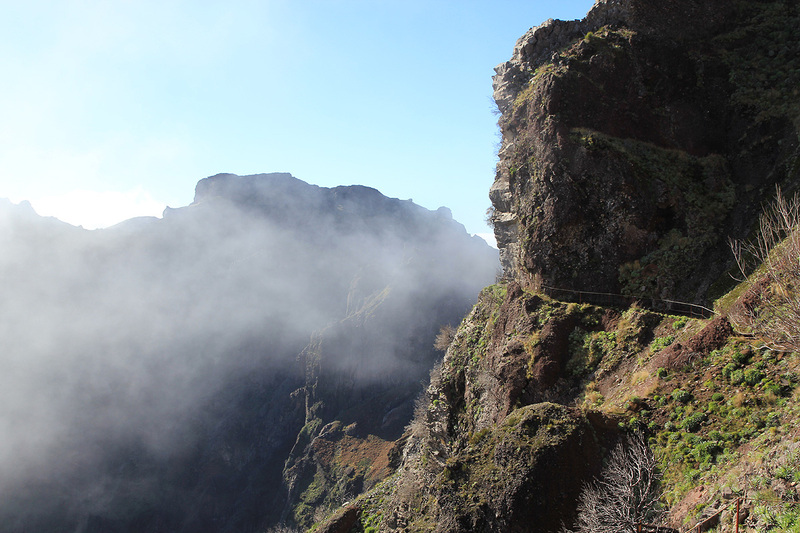 This is the trailhead at Arieiro, elevation about 1800 meter and the highest road on Madeira. 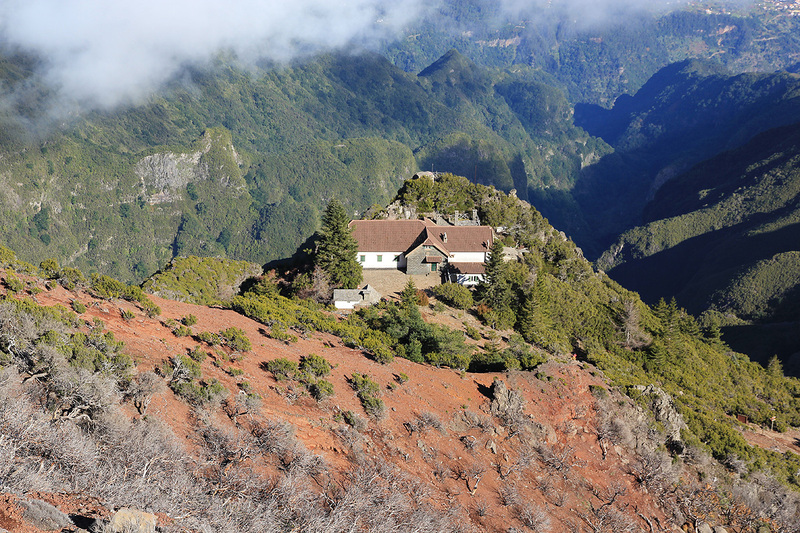 Start out on the famous trail to Pico Ruivo. 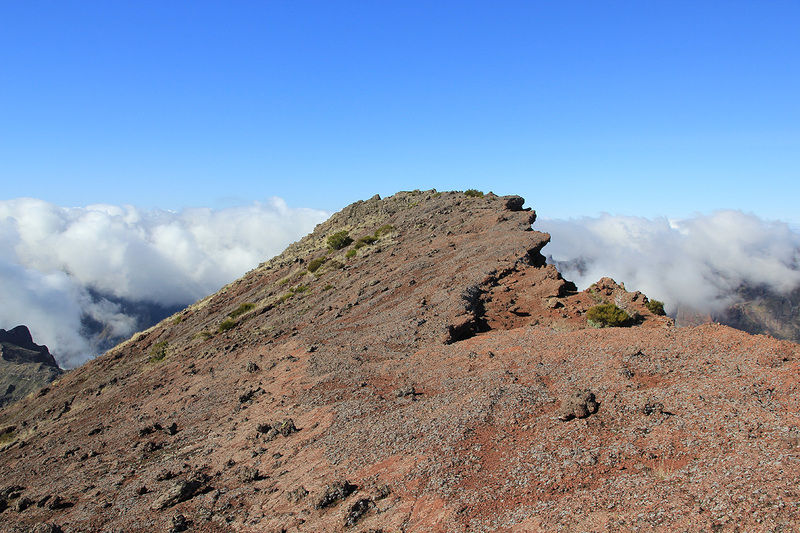 This trail forks left about half way up towards the summit marker of Arieiro from the parking area. 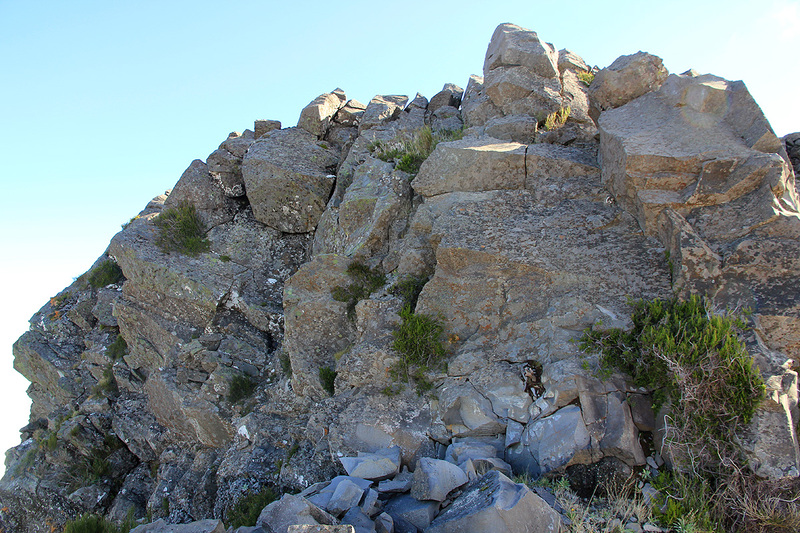 Follow this trail as it descends to the first saddle, then climbs across the first small summit. From here, the trail descends (looking back) a (sometimes) narrow ridge to a saddle at N32:44.355, W016:56.228, elevation about 1717 meter. The trail now traverses on the right side of Pico Cidrao. The summit route forks left at location N32:44.398, W016:56.317, elevation about 1717 meter. This is just when the main trail starts a pretty sustained descent. Follow small steps that have been carved from the rock, then turn right and proceed where you can see traces of a route. Continue around a corner, turning left and heading uphill. 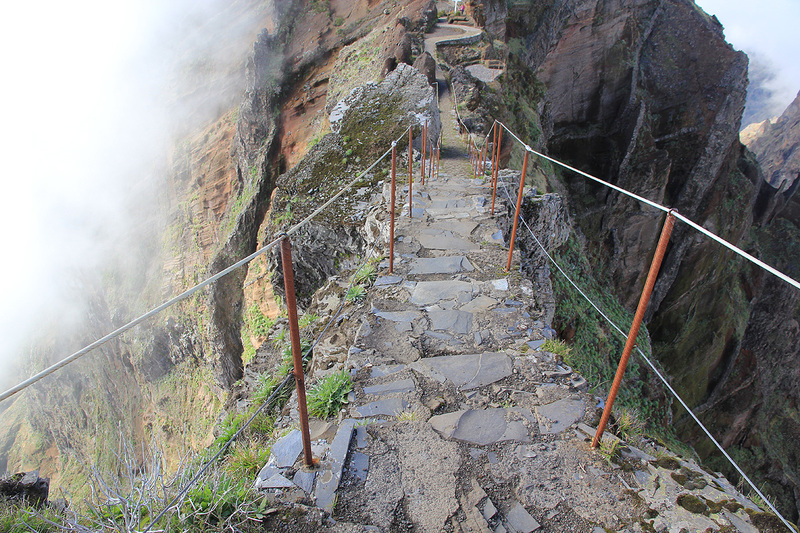 Follow the carved steps and the vague climbers trail. Head right and sneak below and around a boulder, then sharply up left in a natural crack. From here, continue to follow the carved steps as you move right and ascend up a nice, small shelf that will bring you to the top of the summit ridge. Pay attention to where you enter the summit ridge, the return hike may not be so obvious! Proceed left and follow the high ridge until you are right in front of the crux. So far, the route has been (YDS) class 2. This pitch, about 4 vertical meter, is definitely (YDS) class 3. The summit is right where you emerge after this last, but rewarding effort. I followed the route as described and was actually surprised that it involved no scrambling before the very last pitch. Once on top, I explored the ridge a bit further, but decided that it was definitely lower. 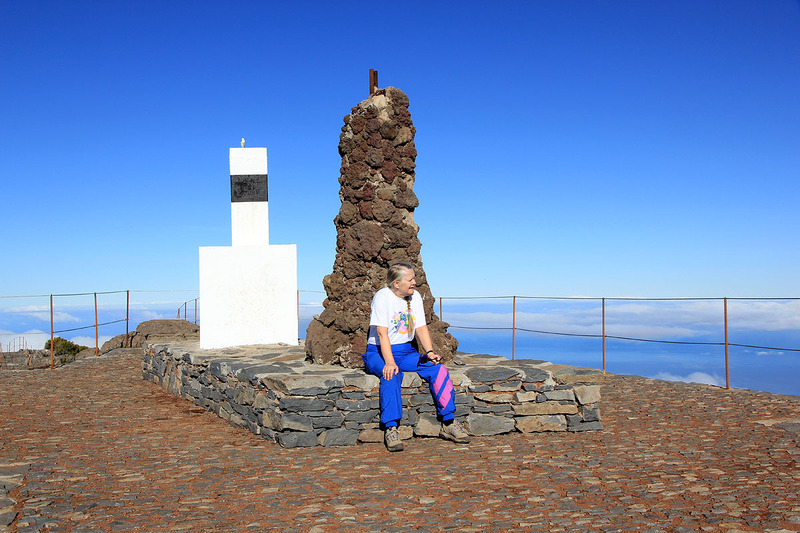 My wife Heidi had continued towards Pico Arieiro and spotted me on top of Cidrao. On top, I enjoyed a good view back towards Pico Ruivo. Returning, I felt slightly uneasy about the short, but steep descent and decided to see if one could circumvent this cliff band at its lower end. That would give a class 2 route all the way at the expense of some elevation loss along the route. This turned out, not to be the case and I regained the elevation back to the summit. The downclimb was actually OK once committed to do it. My next "trouble" came about as I had not paid enough attention to where I entered the summit ridge. I sort of thought that it was at the very far (opposite) end. Getting there involved a downclimb of a second cliff band that I did not clearly recall. For good reason, as I never climbed it in the first place. The return here was actually another steepish class 3 move, at least it convinced me that I had traversed the ridge too far. Once I found the correct beginning, the return down to the main trail was easy. 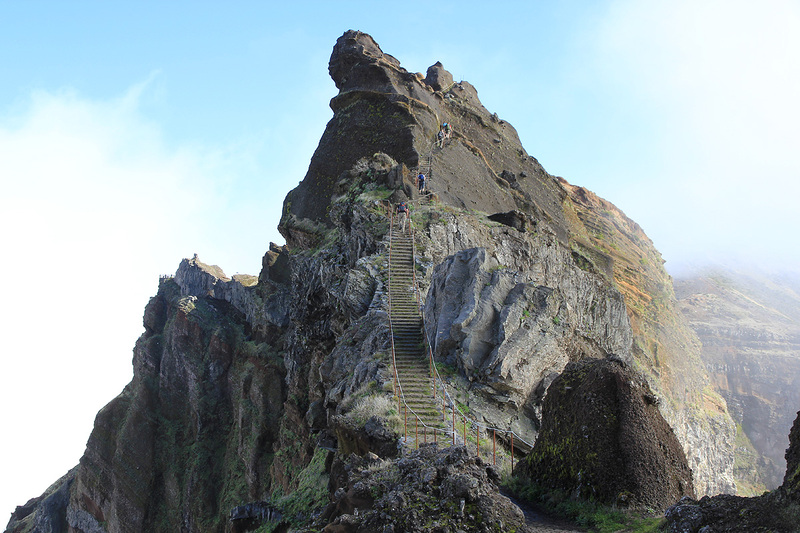 I did this climb on my return hike after climbing Pico Ruivo with my wife Heidi, starting from the parking at Pico Arieiro. This is a world class trail and a description follows below. This trail is about one meter wide at all times. It is carefully laid out and consists of level stretches and stair like steps. There is considerable exposure along many sections. All such sections are protected by two wires running parallel, the upper one being at hand rail level. There are two alternatives near Pico das Torres (1852 meter). The west route is fairly level with several tunnels, the east route involves more elevation gain, has no tunnels and is 1.4 kilometer longer. It is recommended to hike both alternatives. 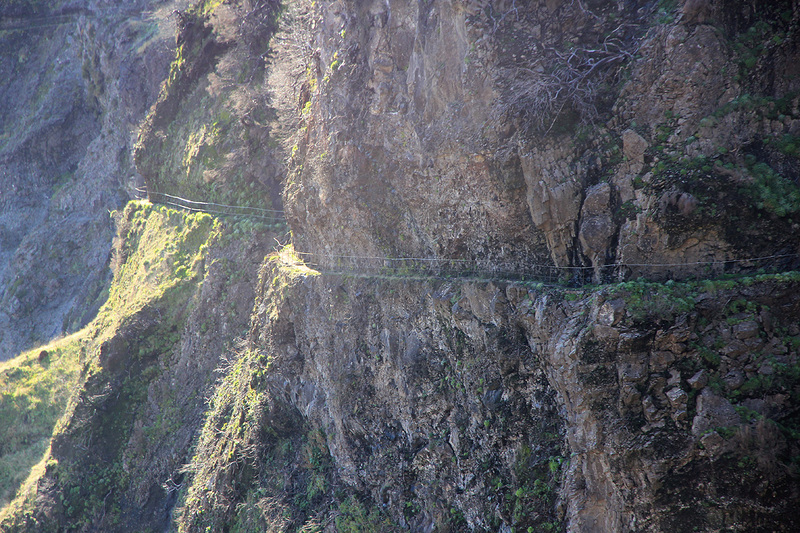 The round trip hike is listed as 12.6 kilometer and takes about 4 hours without any major rests. 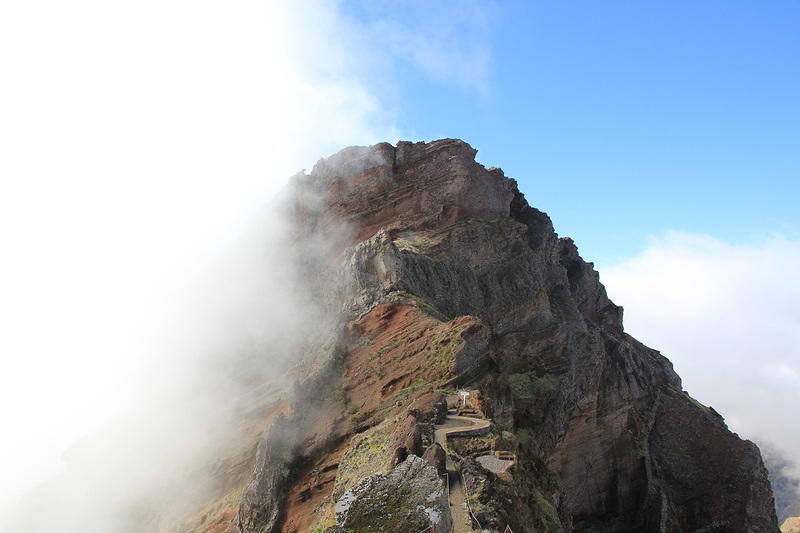 The trail starts above the parking (go up the steps) on the left hand side of the building, but before you reach the summit marker of Pico Arieiro. First, descend to the col (approx. 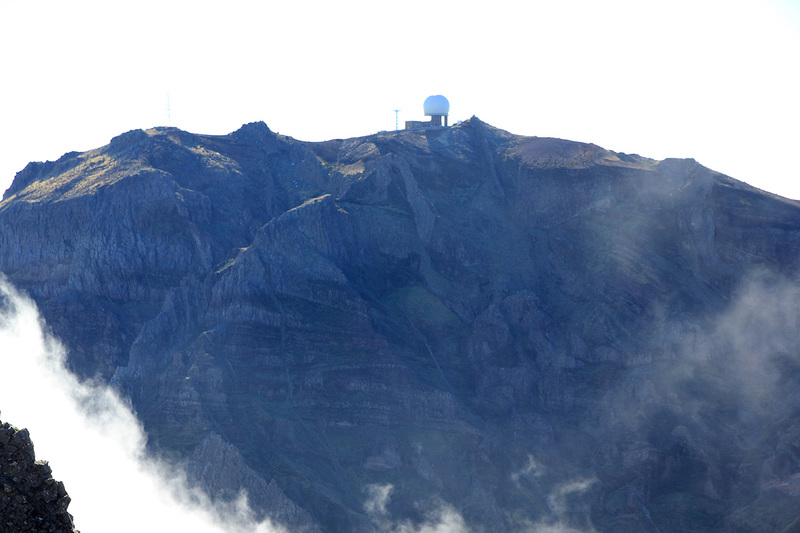 1720m) between Arieiro and Pedra Riga (1771m). Next, ascend essentially to the very top of Pedra Riga. The trail now descends in steps on top of a sharp ridge, the exposure here is impressive. The next col before Pico do Cidrao is approximately at elevation 1712 meter. 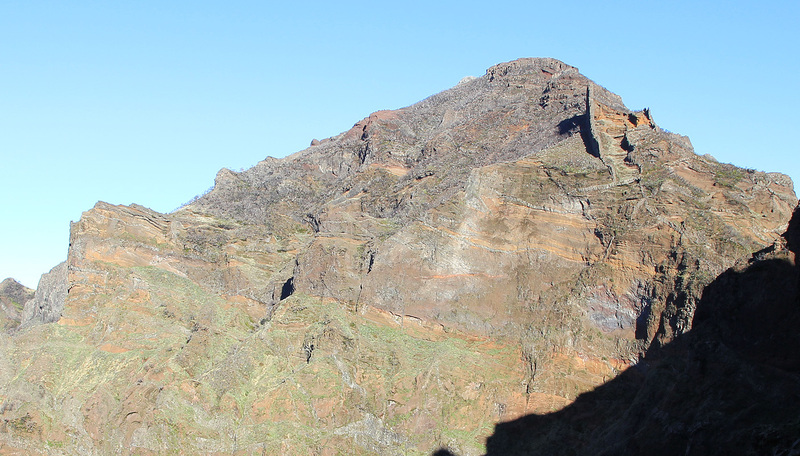 The route traverses on the right side of Cidrao, then descends steeply (steps) to the col before Pico do Gato (1782m). 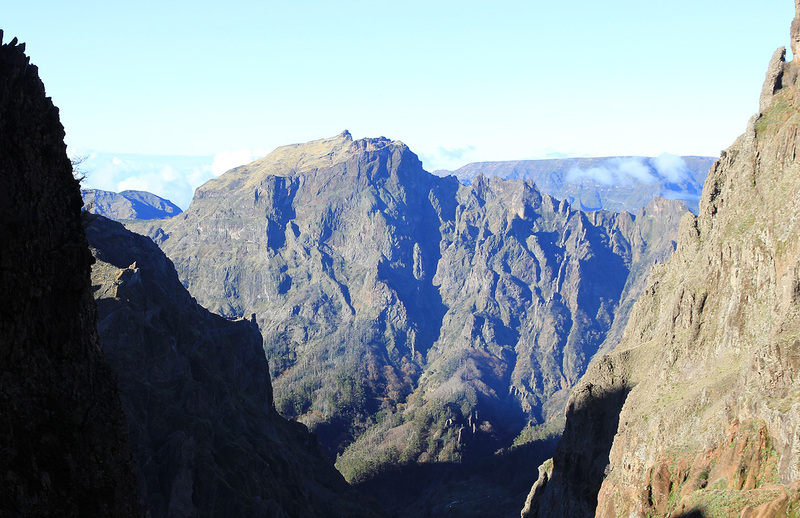 The route now runs directly through Pico do Gato via a tunnel, before descending further to the deepest col between Gato and Torres, this point has an approximate elevation of 1550 meter. Here, the route forks. The terrain in front consists of wild peaks seemingly blocking your way. 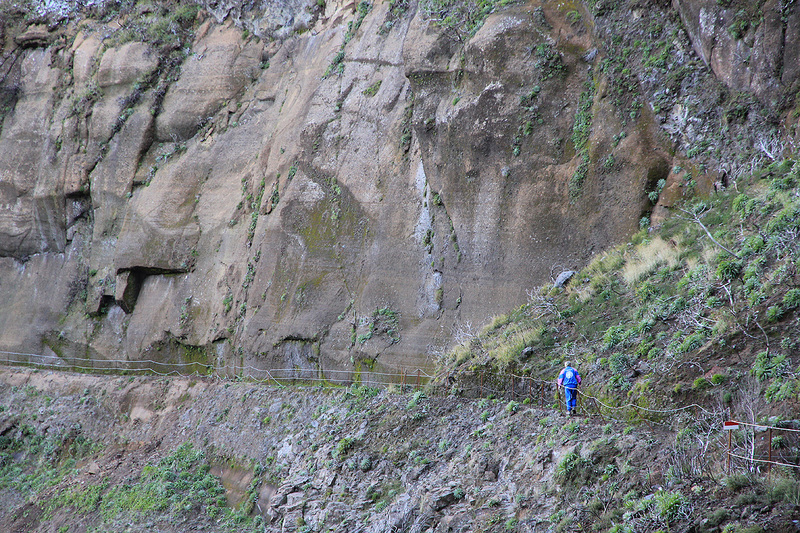 The shorter route goes left and has several tunnels, while the longer variation descends further to about 1510 meter, before ascending to a shoulder of Torres at elevation 1730m (approximately). 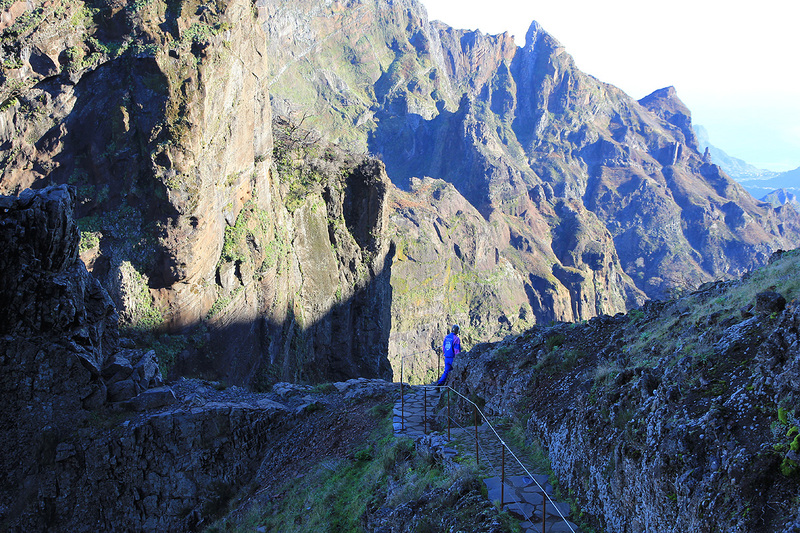 The two routes merge on the east side, curves along cliffs with more exposure before a final ascent to the mountain hut located at the base of Pico Ruivo. 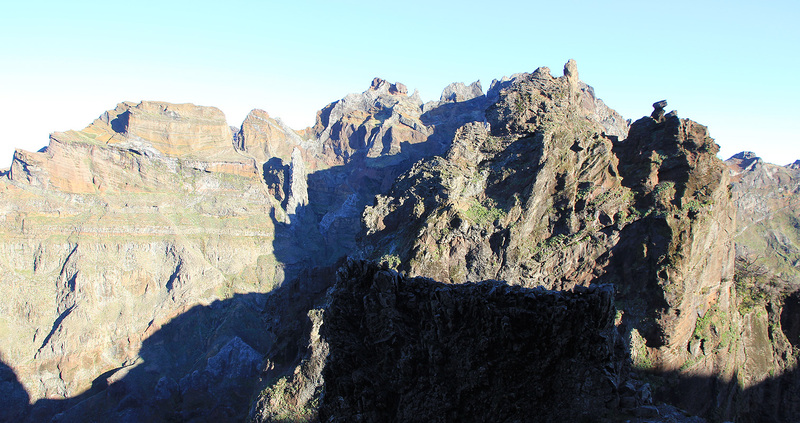 Just before the hut, (seen from the summit) this trail also meets the (shorter) trail that originates at the parking area called Achada do Teixeira (access from the village of Santana). 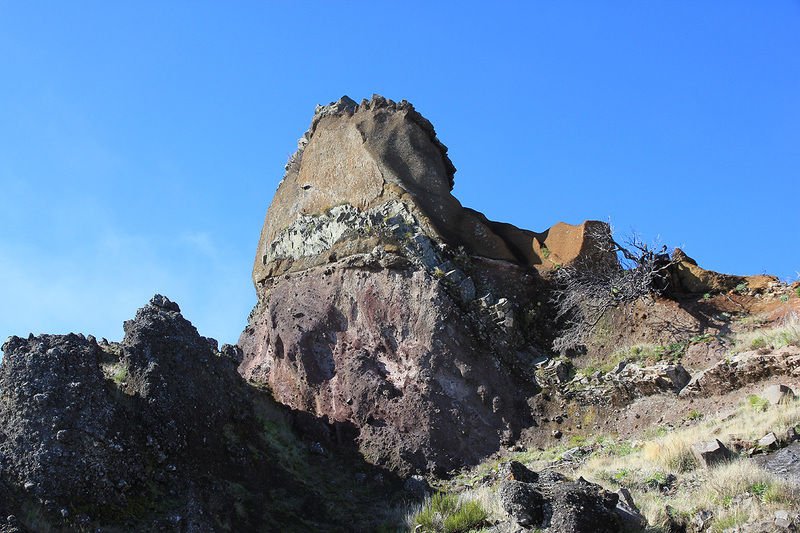 The final 500 meter from the hut to the summit of Ruivo, is an easy hike with no exposure. Final note: The elevations obtained from my Garmin GPS on Madeira were consistently much higher than the listed (map) elevations. 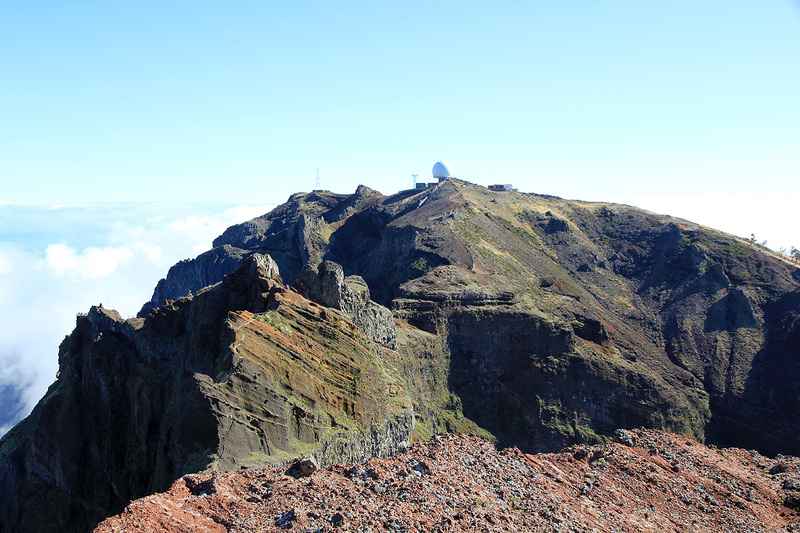 Sea level measured to about 10m meter, however, Pico Arieiro measured 1837 meter and Pico do Cidrao 1817 meter, ie. about 15 meter higher than map elevations. The elevations (for cols) given above have been reduced by about 10 meters relative to my actual readings. 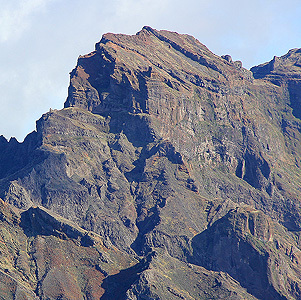 Pico Grande, as seen from the trail. Landscape, as seen from the west variation of the route. 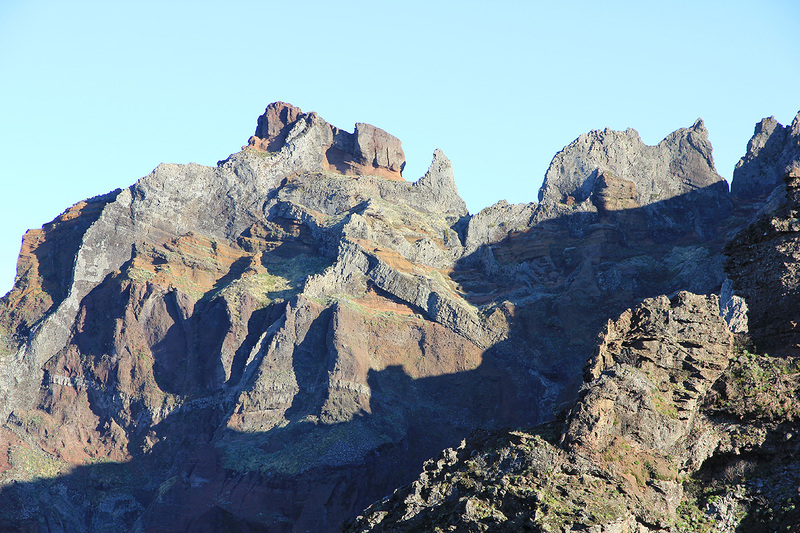 Pico Arieiro, as seen from the east variation of the trail.